Industrial drywall installation services rely on precision and comprehensive quality through every stage of construction to ensure an ideal outcome for builders. In many cases, complex project designs will require the skills of an experienced drywall company for the most success. In order to meet your project’s code requirements, numerous styles of gypsum boards will likely be required. If you are looking for drywall contractors in Chicago to complete your project on time and on budget, AZ Drywall Finishing is here and happy to help. Since 1999, we have worked to provide the highest level of service to commercial projects of all sizes across numerous industries. From metal stud framing to installing drywall, finishing drywall, acoustic ceiling installations, and more, the AZ team is ready to provide the ideal outcomes for your project. Many projects depend on numerous phases of drywall installation to meet building specifications. Today, we’ll highlight four basic approaches for drywall to address a range of environmental influences. When you are finished, be sure to reach out to our commercial drywall company for a quote! This term refers to any gypsum board that is attached before your windows, doors, and aprons. Initially introduced as a drywall installation methods in the 1980s, pre-rocking sounded strange to many people. Why should I install gypsum boards before drying in my building? When properly executed, pre-rocking is done with the purpose of installing your panels right away, leaving a fresh surface for other services to come and cut through later. While not traditionally sound, this method simplifies the complex installation process when trying to coordinate with electric, plumbing, cable, and more. Your project can save time from this simplified process, tasking contractors to only protect the cuts they have made. Simplifying your drywall process can help to achieve more accurate results. This phase of installing your drywall requires precise cuts and joint staggering to ensure code compliance come inspection time. 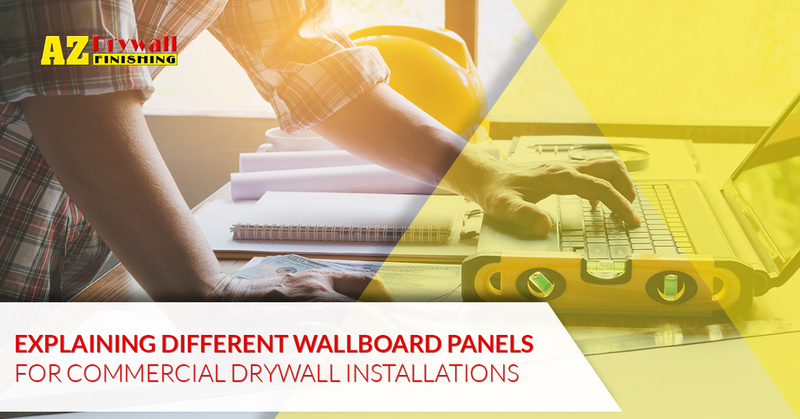 Our drywall contractors will focus on the special wallboard needs, including fire- and water-resistant products. Commercial kitchens, bathrooms, showers, pools, and other moisture-prone areas can benefit gypsum products that are designed to prevent mold growth. AZ Drywall Finishing can also help you with specialized drywall solutions, including durable panels for heavy foot traffic, protective options for defensive purposes, and more. Rough-framed. Our stud framing experts can help to rough frame your commercial building, which entails installing vital support elements in addition to the studs needed for installing drywall. Wall-sheathed. This process follows the framing and consists of attaching plywood or oscillated strand board (OSB) as a basis for attaching future elements. Window-set. The windows in your building perform numerous functions, and are essential for keeping moisture out. Without a proper seal, your future drywall may be at risk for damage! Covered with a roof. This vital component will need to be installed to keep the elements out. The roof installation process will provide the final stage before dried-in construction begins. Keeping the facility free from moisture while installing drywall is vital. Unlike your exterior drywall in the rough-framing stage or the moisture-resistant gypsum board in restrooms and kitchens, standard products are not able to withstand prolonged moisture contact. If you have visited Panera Bread®, Starbucks®, or a Mario Tricoci hair salon in Chicago, you have likely seen the results of our dynamic drywall finishing services. For nearly two decades, our drywall contractors have delivered top-notch results to Chicago businesses with pride. AZ Drywall Finishing will work with you to create an ideal plan to meet your expectations and your budget. Contact us today to learn more, and be sure to fill out our free estimate form!